Vakkert innredet 2 soverom, 2 bad leilighet beliggende i 3. etasje av komplekset med fantastisk utsikt over Adriaterhavet og omkringliggende fjell. Det er et stort felles basseng i sentrum av komplekset, nydelig anlagte hager, 24 timers sikkerhet på stedet. Den åpne planen LR / DR åpner ut mot en stor terrasse med fantastisk utsikt over det krystallklare vannet i Adriaterhavet, Sveti Nikola-øya og de omkringliggende fjellene. Kjøkkenet er utstyrt med høyeste kabinett, hvitevarer inkludert kjøleskap i full størrelse og separat kjøleskap med kjøleskap. Hovedsoverommet har en stor dronning seng, armoire og en-suite bad med nydelig utsikt over de svevende fjellene i Montenegro. Det andre soverommet har 2 enkeltsenger (kan gjøres til en dobbel) med et stort skap og åpner opp mot den store terrassen med utsikt over bassenget og Adriaterhavet. Det er et 2. bad utenfor hovedoppholdet. Leiligheten gir et sikret parkeringsplass i en underjordisk parkeringsplass med hver utleie. Velkommen amerikanere: Alle våre gjester vil ha et lager mini kjøleskap med fortsatt og glitrende flaskevann, øl, flaske hvitvin og kartong med melk på oss! Concierge service levert av vår ledelse. Reise / fly: Montenegro Airlines flyr direkte til Podgorica fra Gatwick, og starter onsdag og søndag onsdag og søndag, Roma til Podgorica tirsdag, torsdag, fredag ​​og søndag, Wien til Podgorica mandag, tirsdag, torsdag, fredag ​​og søndag, Moskva til Tivat på tirsdag, torsdag og lørdag. Jat Airways flyr fra London Heathrow, Paris CDG, og de fleste store europeiske byer til Tivat eller Podgorica via Beograd daglig. Kroatia Air flyr fra / til Dubrovnik fra både Gatwick og Heathrow. BA flyr direkte fra Gatwick til Dubrovnik på torsdag, søndag og tirsdager mellom januar og mars fra og med april, flyreiser er daglig. Property was clean and well maintained. The apartment is a 2br located in an apartment complex. Complex is well maintained and has a pool. Easy walk to beach and several bars/restaurants. Short cab ride to Budva, although it can be expensive if you don't negotiate ahead of time. Overall a great place to stay to enjoy Montenegro. We just returned from a glorious two weeks in Przno. 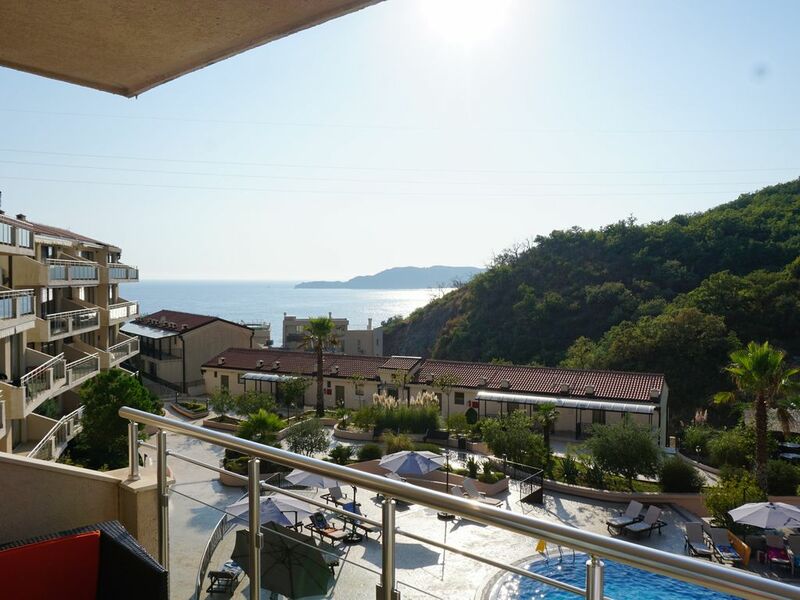 The apartment is great - has one of the best views in the place, looking out to sea and mountains and overlooking the pool. The management agency were lovely - very helpful and kind, and the daily 'spruce' of the flat, was really nice. Przno itself is delightful - whilst there is a large hotel by the beach that is a bit 'mass market', just behind this there are lots of lovely little fish restaurants just by the water, where you can sit and feed the fish whilst you dine. The beach is lovely especially first thing in the morning before the crowd arrives - clear water, great snorkelling around the rock, little restaurant where you can have breakfast. And Montenegro is stunning - fabulous mountains, glorious coastline, lovely locals keen to help (although lack of English can be a barrier - recommend learning a few words of montenegrin, which makes all the difference), really cool ruins at Stari Bar, beautiful old towns at Kotor and Buddva. I totally loved the place and hope to return. A beautiful apartment in a convenient location. The apartment was wonderfully maintained and offered conveniences such as a washer/dryer and Wi-Fi. Breakfast on the balcony with that gorgeous view was a perfect start to each day. The staff at the complex was also wonderful and very helpful. The pool just below the apartment was quite large and each morning pool umbrellas were put up and the chairs arranged to welcome guests. We rarely saw people in the pool though as a 10 minute walk down the hill brought us to the beach and the incredibly warm, blue waters of the Adriatic. Also down by the water are several wonderful restaurants and a beach bar. Grocery stores are a 10 minute drive away and so many of Montenegro's loveliest towns and parks are with easy striking distance. A perfect example of under promised and over delivered. We had a fabulous time!! not in the high season. Thank you Maria and Oliver for the nice stay, the good communication between us and the warm reception by our arrival with cold drinks in the fridge. We stayed in Maria & Oliver’s lovely 2 bedroom apartment this past June 15. The apartment is well appointed, with lovely furnishings and was very perfect clean (actually Maria organize each day a new cleaning ). The kitchen is stocked with all the amenities necessary to cook a meal at home. The complex is well built and sits overlooking the beautiful Adriatic. The pool is a treat as is the concierge service provided by the Management company overseeing the property for the Owners. The town of Przno is so charming and the beach is wonderful. The walk down and back up takes about 10 minutes. We loved being able to sit out on the balcony for our morning breakfasts overlooking the pool and looking out over the Adriatic. The Owners also provided a stocked beverage refrigerator with wine, beer, water, milk and Juice ... really nice touch from Maria. Thanks a lot for everything Maria. Thank you for your lovely review. It was a pleasure having you stay with us this past June. We are so pleased that you enjoyed the apartment and complex. We look forward to welcoming you and your family back again soon! Nous avons beaucoup apprécié notre séjour dans l'appartement de Maria et d'Oliver; l'appartement est calme, bien équipé, très propre (le ménage est fait tous les jours par le personnel de la résidence). La grande terrasse nous permettait de nous prélasser et de bénéficier de la vue sur la mer et sur les couchers de soleil. Les extérieurs de la résidence sont très bien entretenus (jardin, piscine) et le personnel est très agréable. Le parking privé est un peu très apprécié (surtout en pleine saison). Un petit détail à améliorer (comme l'avait notifié un précédent locataire) : il serait bon d'équiper les 2 chambres de rideaux occultant la lumière, car, lorsque l'on est habitué à l'obscurité complète pour dormir, la luminosité est gênante. Nous ne connaissons pas Maria ni Oliver mais avons eu de très bons contacts par mail. Ils sont très chaleureux et nous avons même eu la très agréable surprise, en rentrant de ballade, de découvrir un gentil petit mot de leur part avec une bouteille de vin blanc monténégrin, pour se faire excuser d'un problème de wifi que nous avons eu mais qui, d'ailleurs a été solutionné aussitôt que nous l'avons signalé.... Un grand merci à Maria et Oliver. Blue Horizon ligger over den pittoreske fiskerlandsbyen Przno innen gangavstand til Milocer (den tidligere kongelige familiens sommerferie) og Sveti Stefan. På 70-tallet var Sveti Stefan en kjendis-hangout, inkludert gjester Sophia Loren, Bobby Fisher, Claudia Schiffer og Carlo Ponti. Przno seg selv er en sjarmerende landsby med mange flotte fiskerestauranter, kafeer og pizzeriaer langs sjøen, inkludert Hotel Maestral. Hotellet har et kasino og en nydelig utendørs terrassert kafé med utsikt over stranden. Przno er en 10 minutters kjøretur fra Budva, og det er gamlebyen, 30 minutters kjøretur til UNESCOs arvested Kotor. Przno Beach er 320 meter lang og er en kombinasjon av sand og delvis steinete, Kamenovo Beach ligger i nærheten og er en hovedsakelig sandstrand ca 720 meter lang. Blue Horizon Complex har nydelige anlagte hager og et felles svømmebasseng, fantastisk utsikt over Adriaterhavet og de skrånende fjellene i Montenegro. There is a Tourist Tax of .80 cents per person per night payable to our Management Agent upon arrival. Children under 12 years of age pay no tax. Payments can be made by Credit Card via PAYPAL (there is a 4.3% additional fee associated with CC payments) or by bank transfer. Late Check In Fee payable in cash to our Management Agent on site upon check in. Late Check In after 9pm.